Franz Ferdinand is releasing its fourth studio album August 27, titled Right Thoughts, Right Words, Right Action. From the soundtrack in the recently posted video, it's a return to the cheeky fun that made the self-titled debut such a success back in 2004. Theirs is a tightly wound indie rock that burst from the Glasgow Art School scene with the infectious international hit, "Take Me Out." 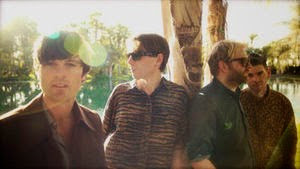 The band remains the original quartet, with Alex Kapranos (lead vocals and guitar) backed by Nick McCarthy (keyboards, rhythm guitar and vocals), Paul Thomson (percussion and vocals) and Bob Hardy (bass). Check out the video along with the track list and some tour dates info.